Hanoi’s first Bus Rapid Transit (BRT) route has seen overload at peak hours as each bus carries up to roughly 120 passengers on average. 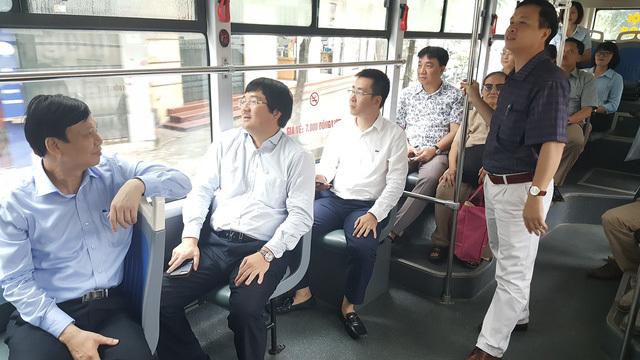 Officials from the Hanoi Transport Department and the Hanoi Transportation Service Joint Stock Company (Transerco) go on an inspection trip on the BRT bus on September 10. The piloted route connecting Kim Ma Station in Dong Da District and Yen Nghia station in Ha Dong District was launched by late December last year. The 14.5-km route takes up between 40 and 42 minutes and is available 17 hours per day, from 5 am to 22 pm with a bus departing every 5, 10 and 15 minutes. According to the Hanoi Department of Transport, passengers seem quite to be pleased with the route which transports around 13,300 people per day. At rusk hours, the route often sees the overload as each bus carries nearly 120 passengers compared to the normal figure of 70 people as designed. But, at off-peak times, each bus transports just 20 passengers on average. Nguyen Hoang Hai, director of the Hanoi Urban Transport Management and Operation, said that Hanoi currently has 109 buses, including 74 subsided and 15 piloted ones, covering all areas of the city and linked to the neighbouring provinces of Bac Ninh, Ha Nam, Hai Duong and Hung Yen. Since 2014, the number of passengers who chose to go by bus in Hanoi has decreased from 506 million in the year to 469 million in 2015 and 436 million in 2016. This year, the city has set a goal to raise the bus passenger number to 450 million. This is partially due to Hanoi’s serious traffic jams which affect the working schedule of buses. Earlier, the municipal authorities have said that they also considered opening one more bus rapid transit route from Kim Ma Station to Hoa Lac Highway after gaining experience from the operation of the first route.